Written and visually designed for students ages 10 to 17, the 2010 Compton's by Britannica has been thoroughly reviewed, updated, and revised by educators, expert contributors, and Britannica editors. Packed with dramatic pictures, detailed diagrams, and engaging text, Compton's gives young readers the basic facts and entices advanced students to dig deeper for the answers to their more complex questions. New and revised articles include China, India, Latin America, medicine, Native Americans, petroleum, and telecommunications. Keyed to National Curriculum Standards, Compton's is ideal for school-aged children to use for projects and homework assignments. Students will be drawn in by 23,000 vibrant images, Fact Summaries, and Facts About boxes. Plus, more than 37,000 articles deliver extensive coverage of topics that students need, from art history to geography to sports and more. 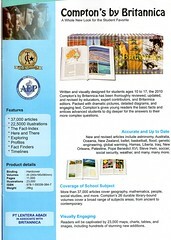 Children will gain confidence in their research skills by using Comtpon's. Helpful features and tips are located throughout the set so that they can learn to conduct research independently. Fact Finders provide a list of related articles, and Further Resources contain other options for students to use after they've explored the encyclopedia. "...international in scope...fabulous gems are found in most every volume. Geographical entries contain the most often requested information..."